Learn how to use the new Content-Aware fill in Photoshop CC 2019. Discover why everyone is so excited about this updated tool. 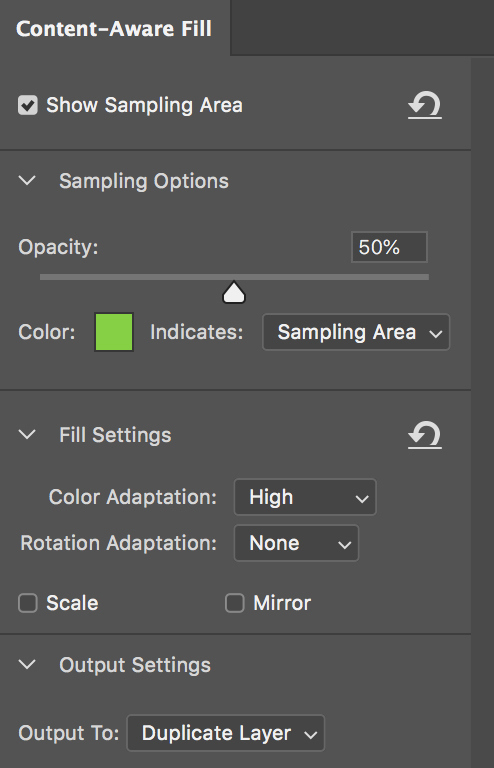 The biggest and most talked-about update in Adobe Photoshop CC 2019 has got to be the new Content-Aware Fill options. 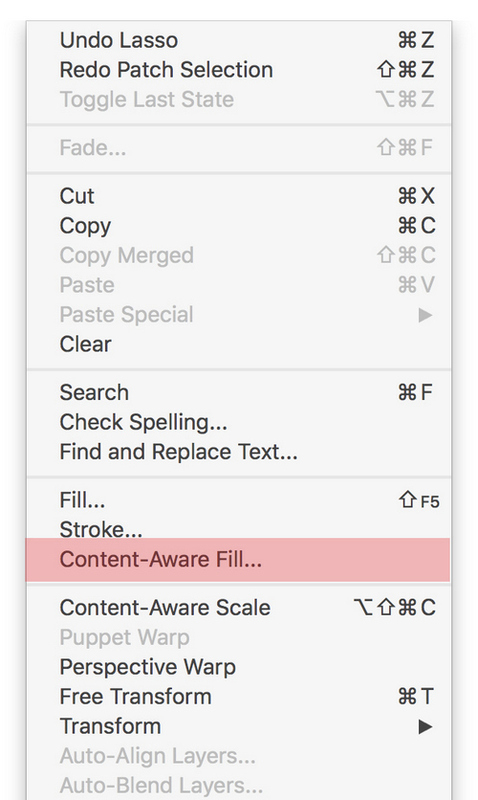 Adobe has expanded the range of options for Content-Aware Fill to cover most the things we all wanted it to do . . . non-destructively.
. . . to name but a few. We’ll address those to get you going with the new tool, then show a few examples. So hold your wig and let the new Content-Aware Fill blow your mind. When you want to fill a hole, or replace existing content in an image, Content-Aware Fill will guess what should be in the selected area using the information around the selection, and then fill that space accordingly. Now let’s use this thing and get familiar with it. After you make your selection, go up to Edit > Content-Aware Fill. With both of the above tools, you’ll have options in the Option bar to further refine (smooth, feather) your selection. Check out this article for more on using those controls. In the middle on the left, you’ll see the original file with the selection revealed in the green overlay. This makes it easy to see your selection. On the right is your live preview. This is awesome. Previously you had to just hit Enter and see what happened. Now you can see your changes in real time. On the right side of the screen is your window for the functional settings of the Content-Aware Tool. This is simply where you control your interface. Change the Opacity, Color, and whether the overlay indicates the Sampling Area (affected) or Excluded Area of the image. This is the heart of the Content-Aware Tool. This directly controls the resulting effect. Color Adaptation – Controls contrast and brightness for the closest match possible. Choose None, Default, High, or Very High to match the surrounding area’s smoothness or color gradations. The differences in each choice can be pretty drastic, and that’s when the live preview is most awesome. Rotation Adaptation – Allows the selection to be rotated in order to match curving parts of an image. Choose None, Low, Medium, High, or Full from the drop-down menu to select how much rotation you’ll allow it to use when filling the selection. Scale Checkbox – Allows the content to be scaled in order to match things like repeating patterns or perspectives. Mirror Checkbox – Allows content to be flipped horizontally, to aid in replacing content in a mirror-image. This section controls how the effect will be implemented in the image once you’re done and hit OK. It will be exported to the file as a direct replacement in Current Layer. In New Layer, the selection alone will be exported above the current layer in order to non-destructively allow you to move or change the result. Duplicate Layer copies the whole working layer, with the effect implemented. So, armed with all that info, I used these settings to remove the two trees in the middle of the composition. After fiddling with a couple Fill Settings, High looked the most natural, filling the space with what looks like trees on the background slope. I gotta say, this is a mighty, mighty impressive result. So, I heartily recommend upgrading if you need to update or streamline your retouching tools. This new Content-Aware Fill tool is almost worth it alone.